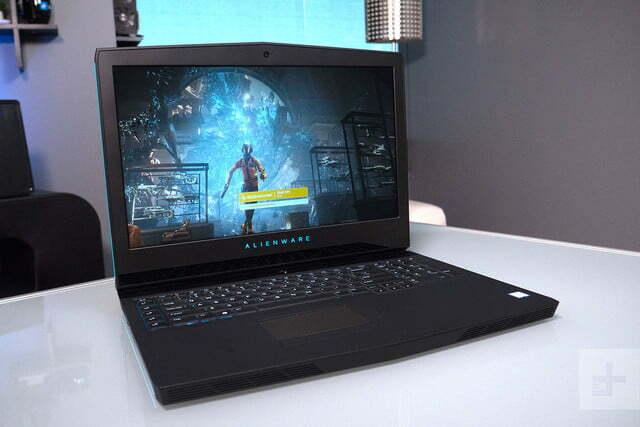 Alienware threw everything it could at this laptop, cramming a six-core Intel Core i9 processor in there to go along with 32GB of RAM and a GTX 1080 graphics card. It’s certainly outfitted like a gaming desktop, so let’s find out if it performs as well as one. 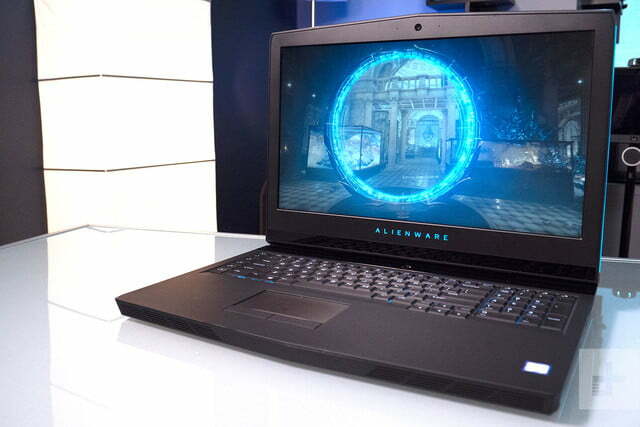 On the outside, the Alienware 17 R5 looks a lot like its predecessors. It features a soft-touch interior that still attracts fingerprints with every touch, a metallic shell on the top and bottom, along with a stylized grille on the front edge. Around back, you’ll find a big block of metal and plastic that houses a pair of vents for disposing of the enormous amount of heat generated by its powerful hardware. It’s not a groundbreaking design, but it works well. 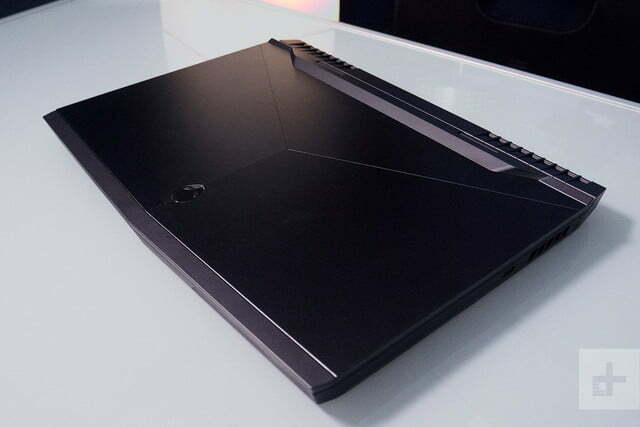 It’s still distinctly Alienware — futuristic angles, RGB lighting on the chassis, an inlaid pattern on the back side of the display. 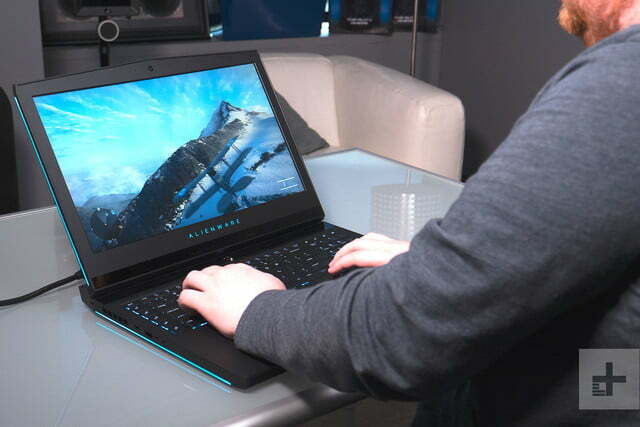 And it’s clearly a gaming notebook, much more along the lines of the Acer Predator Helios 500 than the more conservative Razer Blade Pro. 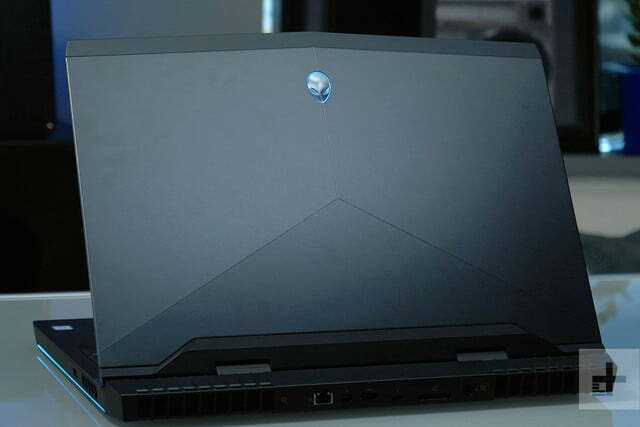 The Alienware’s metallic finish is a bit darker than it has been in the past, but otherwise this is the same design you’ve likely seen on previous machines. It works, looks nice, but it’s starting to show its age in one small area: The display bezels. The 17-inch display is great, but we’ll get to that later, right now we’re talking about bezels. The frame around the display is almost an inch thick all the way around, and because of the shape of the chassis, the angled front-edge makes the top display bezel even thicker. It’s just an awful lot of wasted plastic and it looks dated compared to smaller, slimmer offerings. The Razer Blade Pro has thick bezels around its display, but because they’re recessed, part of the glass display itself, they’re less noticeable in everyday use. Unfortunately, big bezels seem to be par for the course when you’re shopping for a 17-inch laptop. A credit to the Alienware 17 R5’s overlarge chassis, there’s an awful lot of room to fill with ports, and Alienware does just that. The power adapter plugs in on the back-side of the chassis, right beside an ethernet port, USB-C port with Thunderbolt 3 support, HDMI port, and mini-DisplayPort. On the right-hand side there’s a single USB-A port, and on the left a USB-C and USB-A port, along with headphone and microphone jacks. 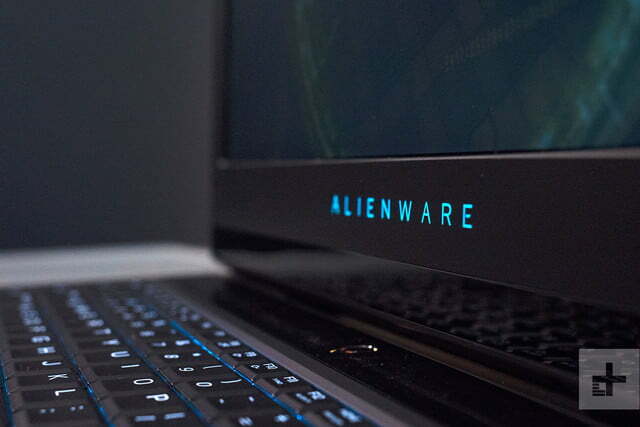 The port selection is pretty standard, with a couple appreciated inclusions like mini-DisplayPort, but it’s their placement that really makes the Alienware 17 stand apart from the crowd. 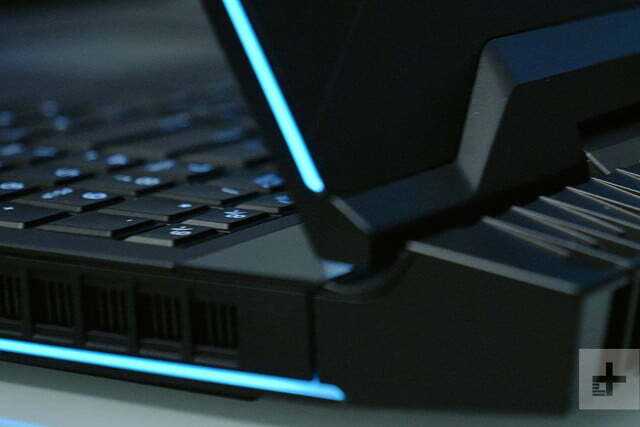 By putting mission-critical ports on the back-side of the laptop, they’re always going to be out of your way when the Alienware 17 is sitting on a desk — which let’s be honest, is where it’s going to spend most of its life. The Acer Helios 500 took the same approach with some of its ports, and we like it. These things are laptops in name only, and so it’s an excellent design decision to position the ports so they won’t clutter up your desk. 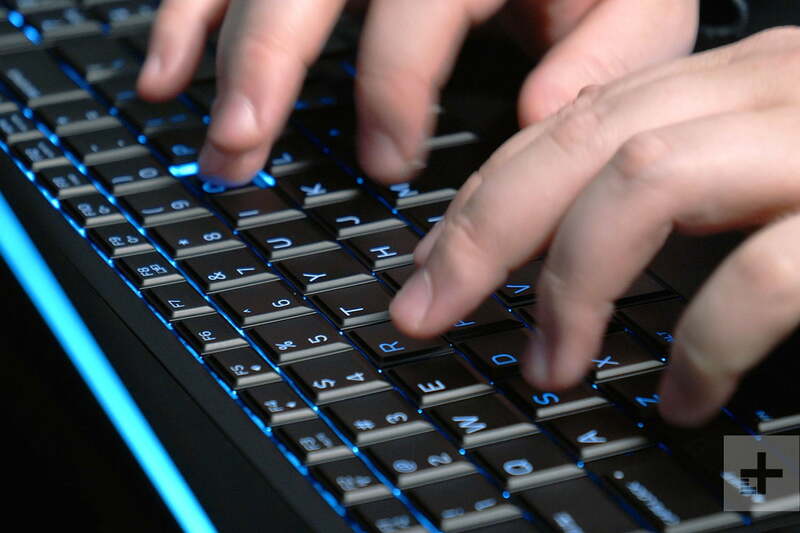 The keyboard offers a decent keystroke depth and quick snappy keys, it never feels too much like a laptop keyboard — none of that mushiness associated with membrane keyboards, a characteristic that’s shared by “real” gaming notebooks like the Helio 500 and Razer Blade Pro . 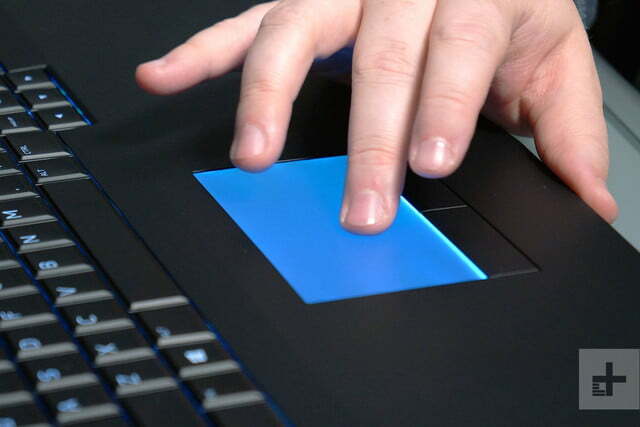 Similarly, the touchpad works just as smoothly as it should, a credit to Windows Precision Touchpad support. It feels silky and smooth to the touch, but in an era of massive touchpads, it feels a bit small at times. 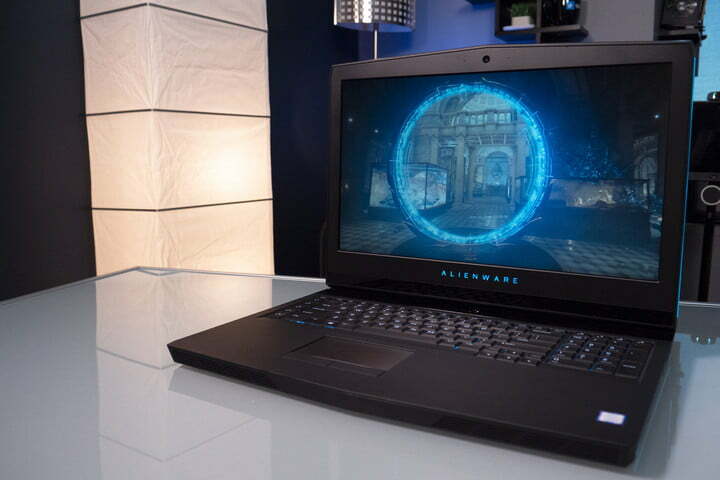 Another input the Alienware 17 features is a built-in Tobii Eye Tracker, which is unusual even for dedicated gaming machines. Situated right below the display, the eye tracker has two functions: One, it’ll let you do some fun things in some games — but not very many. Secondly, you can use it for Windows Hello, Microsoft’s facial recognition login system. Windows Hello allows you to login by just opening your laptop and looking at the eye tracker, it’s a nice feature and definitely beats typing out a password every time you open your computer. 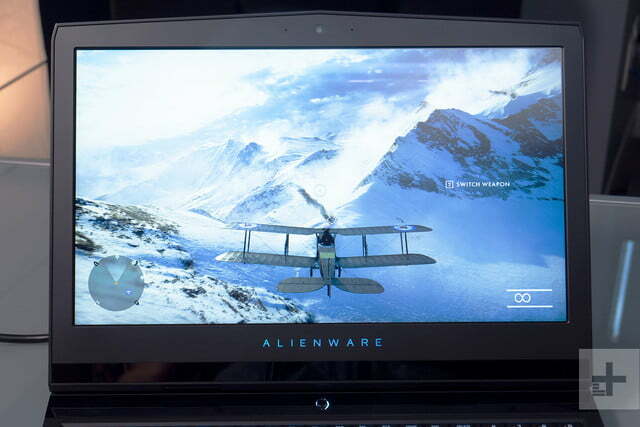 We already covered the Alienware 17 R5’s awkward display bezels, but the good news is the display itself is just fine. To the naked eye, colors are bright and vibrant without being washed out or too heavily saturated. The 120Hz G-Sync panel makes even the most basic mouse movements captivating. Seriously, just moving the mouse around is an absolute joy because of how liquid-smooth the motion is. That’s just an appetizer though, once you see this display panel in action, running your favorite games at high or ultra-high settings without skipping a beat, it’s going to be hard to go back to a plain old 60Hz display. The resolution here is also worth mentioning. The 17-inch display panel features a 1440p display resolution, which is unusual given the high refresh rate. It’s an excellent pairing though, like chocolate and peanut-butter, the high resolution and high refresh rate complement each other beautifully. Games are impossibly smooth and fluid, and because of the resolution, they’re remarkably crisp. The Helios 500 has an even faster display with a 144Hz refresh rate, but that’s paired with a 1080p display and so it’s a choice between being slightly faster and being higher resolution. The numbers paint a slightly more pedestrian portrait here, but the aforementioned aspects more than make up for the display’s shortcomings. 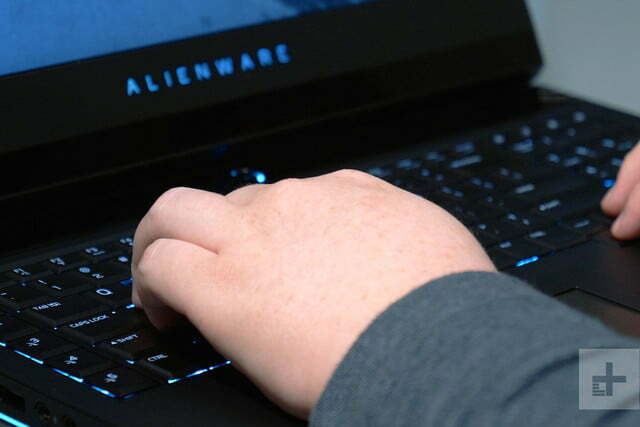 Looking at color gamut, the Alienware 17 R5’s display hits 93 percent of the sRGB color space, which is the one you’re going to see most often. 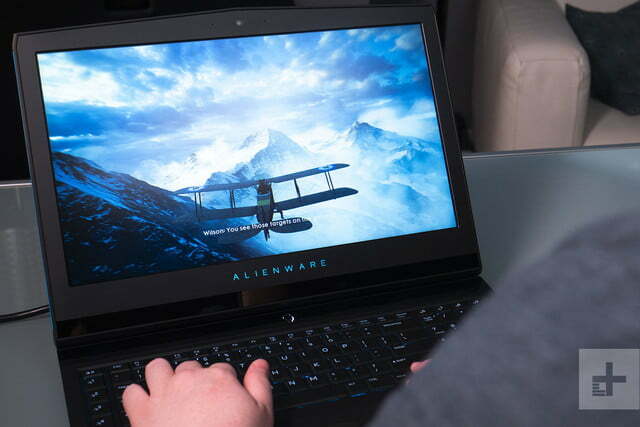 On the more finicky AdobeRGB color space, the Alienware’s display hits only 73 percent, which is about what we’d expect out of a laptop display that isn’t geared toward professional use and unsurprisingly are similar results to the Helios 500. 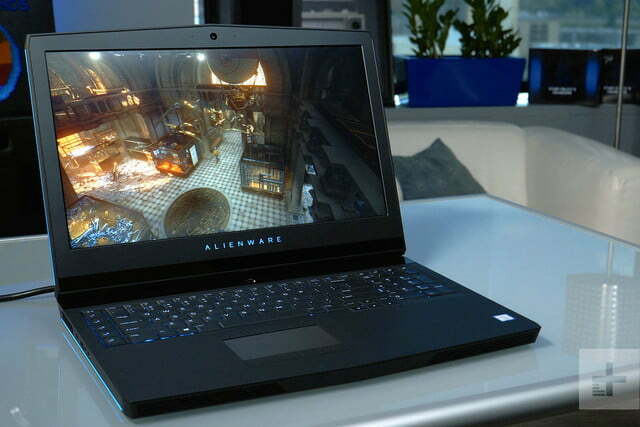 Moving on, we saw the Alienware 17 R5’s display top out at a contrast ratio of 560-to-1. That’s not bad, but it’s not great either, falling behind the Helios 500 and the Asus ROG Zephyrus. Overall it just means colors aren’t going to pop quite as much as they could, and that’s a side effect of the 120Hz display. 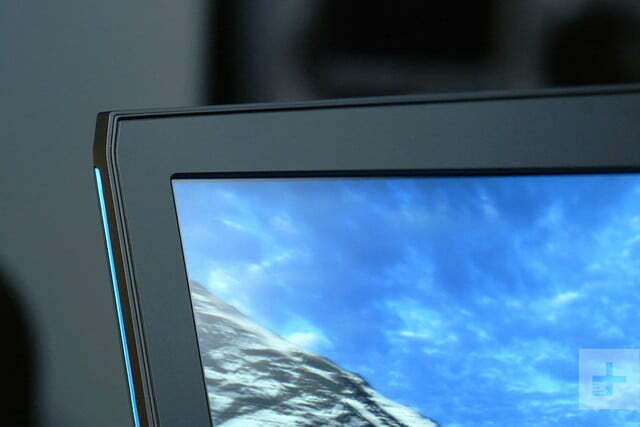 To hit that high refresh rate, Alienware uses a TN display panel, and they’re typically not as vibrant as more common IPS displays. For comparison, let’s look at the Razer Blade Pro 17. Our review unit featured a 4K IPS display with a refresh rate of 60Hz. With a brighter IPS display, the Blade Pro 17 hit a contrast ratio of 900-to-1, managed to render 98 percent of the AdobeRGB color space, and featured slightly better average color error. This is the trade-off between a 120Hz TN display like the one in the Alienware 17 and a more vibrant, but 60Hz, IPS display. First up let’s look at how it does in Geekbench. Compared to regular 8th-Generation Core i7 processors, it’s clear the Core i9 is very powerful, but it’s hard to put it in context with just a couple scores. That’s why we ran a couple real-world benchmarks to give you a better idea of just how powerful this six-core processor really is. We also used Handrake to convert a 420MB video to H.265, and the Alienware finished the task in a quick 184 seconds. That’s not the fastest we’ve seen, though, as the Dell XPS 15 (more of a productivity than a gaming system) finished more quickly at 150 seconds with its Core i7-8570H CPU. The Asus ZenBook Pro 15 UX580 was the fastest we’ve seen in this test, finishing in just 139 seconds thanks to its own Core i9. There’s a lot of space inside that chassis, and the Alienware 17 takes good advantage, featuring both a 512GB SSD and a 1TB mechanical hard drive. These are fairly standard options, and the speed here is about what we’d expect. The 512GB SSD was relatively quick on its feet, hitting a read speed of 1,912 megabytes-per-second and a write speed of 1,313MB/s. Even swinging big files around, the SSD kept up beautifully. 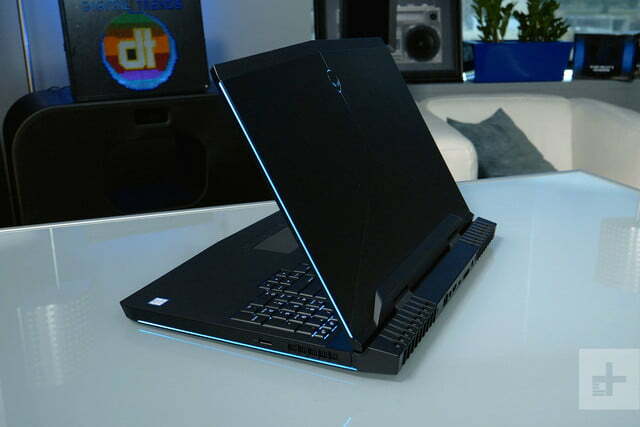 One other 17-inch gaming notebook that we feel compelled to mention is the Acer Predator Helios 500. It’s also an aggressively styled, in-your-face gaming notebook that’s not trying to blend in, and it also comes stocked with some seriously fast components (albeit, not quite as fast as the Alienware). 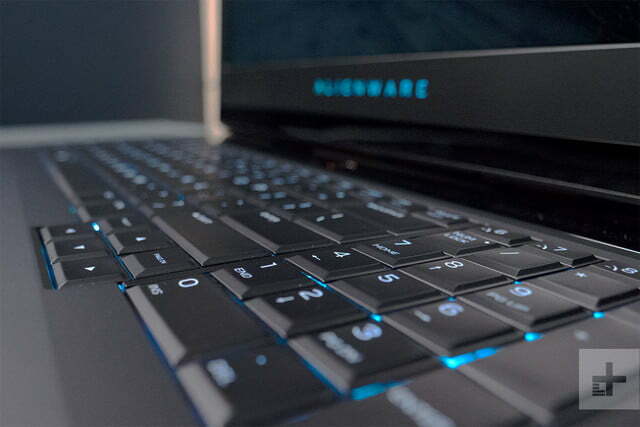 At the other end of the spectrum, you might want to look at the Razer Blade or Razer Blade Pro. With similar pricing and hardware, but a much slimmer build, these are a bit more suitable for everyday use.